Clarisse Arte is on the first floor of the building of the former convent of the Poor Clares in Grosseto. Defined as the Grosseto’s "civic modern art gallery", the Clarisse Arte centre is actually much more: it is a multidisciplinary site that houses and displays a permanent art collection, and promotes exhibitions, artist-in-residence programs, educational workshops, and other initiatives. Clarisse Arte, managed by Fondazione Grosseto Cultura, is a dynamic environment which does not merely represents a place of preservation and celebration of the past but, communicating and interacting with other civic cultural entities - starting from the organizations occupying the other areas of the building of the Poor Clares (Museo Lab and Collezione Ferretti) - wants to define a vital area of ​​cultural development, a multi-purpose centre of intellectual activities that are in direct contact with the most extensive network of museums, libraries, and national and international art circuits. 3. a media library; thanks to an agreement with Fondazione Sistema Toscana, the media library of Clarisse Arte gives you access to the entire digital archive of Mediateca Toscana. 4. a depository of works of art selected among the municipal and provincial administration’s collections; it is open to the public. One of the themes of these works of art is "The research on the territory: the origins" (works by Aldi, Pascucci, Vagaggini, Capezzuoli, Rosignoli...). Another theme is "Masters of realism" and includes works by Levi, Treccani, Grazzini, Guerricchio, Mirabella, Guccione... and artists who developed a specifically local translation of realism (Gentili, Dominici, Faccendi). Most of the works displayed are paintings, but there are also precious engravings on copper plates (Novelli, Vespignani, Zancanaro) and ceramic (Bonaldi, Aspinall, Okai) and plaster (Niki de Saint Phalle) sculptures. The main body of the Convent of the Poor Clares in Grosseto, distributed on three floors with a lovely small inner courtyard, was built in the seventeenth century. Abandoned by the nuns at the end of the eighteenth century, this building went through two centuries of history (it was also merged with the old Ospedale della Misericordia), which gradually led it to degradation. It contained painters’ apartments and studios until it became a property of the municipality in 1995. Restoration works started at the beginning of the new century. In recent years, the building was used as a temporary location for the course in Archaeology of the branch of the University of Siena in Grosseto. 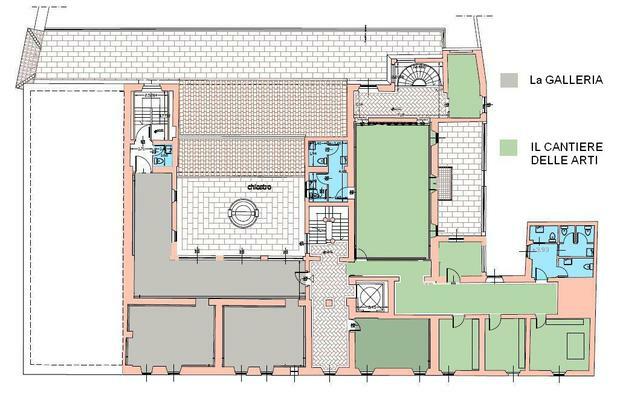 Today, the palace of the Poor Clares is set to become a dynamic cultural centre, which looks ahead by telling its story: its architectural structure has not been changed, and the exhibition spaces or offices were obtained from the previous lecture halls and, in some cases, from medical rooms of the old hospital. Clarisse Arte organizes annual courses aimed at promoting contemporary art, cinema, photography and other artistic disciplines. The educational section of Clarisse Arte provides a number of thematic tours and interactive workshops designed to meet the needs of primary and secondary schools. To participate, please make a reservation by calling the number +39 0564/453128 and asking for Marta or Claudia. For information and inquiries: clarissearte@fondazionegrossetocultura.it. Guided tours: tours in Clarisse Arte guided by the welcome service personnel. For information: +39 0564/488547 or clarissearte@fondazionegrossetocultura.it. You can consult the Library specializing in local art, the archive of maremma artists, the general catalogue of the city’s works of art. You can consult the Digital Archive of Mediateca Toscana. For information: +39 0564/453128 or clarissearte@fondazionegrossetocultura.it. When there are no temporary exhibitions, the offices, the library, the archive and the media library are open by appointment only, please write to clarissearte@fondazionegrossetocultura.it or call the number +39 0564/488547.